These keychains are a perfect mini versions of their larger counterparts! 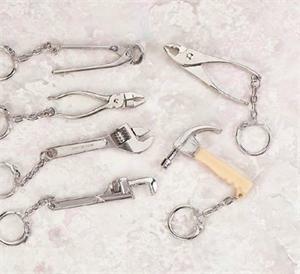 These mini tool keychains come in an assortment of pliers, hammers, wrenches, and nippers and are approximately 2.5 inches long. Don't be fooled by their size, although toy-like these mini tool novelty keychains actually function as the tool depicted! Great gag gifts for mechanics, plumbers, electricians, etc! Price per tool noted - NOT SUITABLE FOR SMALL CHILDREN UNDER FIVE - ADULT SUPERVISION RECOMMENDED.